The Hurricane’s story spans over 20 years with the first Sydney steakhouse opening in 1995. 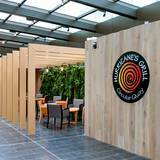 Famous for flame grilled steaks and ribs, Hurricane’s Grill is a well-known brand and loved by many from around the world. One can simply ‘follow their nose’ with the famous aroma of the secret basting sauce that invites every customer to our restaurants. Please fill in your information below and our Events Coordinator will contact you as soon as possible to book your event. If you’d prefer to talk now, please call us at (02) 9211 2210.